I have a fenced in backyard and my cat never leaves it. Isn’t this okay? While having a fenced in backyard works well for confining most dogs, cats can readily climb fences. Even if your cat doesn’t ordinarily leave your backyard, you can’t be sure that something won’t frighten her and cause her jump the fence. The fence also won’t keep other cats out – not to mention raccoons or other wild animals. This means that your cat is at risk of getting into a fight with one of these other animals, or of picking up a disease from them. Some diseases such as feline panleukopenia are capable of surviving in the environment for prolonged periods of time, while others such as feline respiratory disease can only survive for short periods of time. Passing cats can contaminate your property with these viruses, potentially exposing your cat to an infection. My cat is vaccinated according to the recommendations of my veterinarian. Doesn’t this protect her? Although no vaccine is 100% effective, to a great degree, your cat will be protected against the diseases that she has been vaccinated against. For some serious infectious diseases, there are no available vaccines. My cat is very gentle by nature and I don’t think she would fight with another cat. Why should I worry? Cats are territorial by nature and will usually defend their home from intruders. Even if your cat is not interested in defending her territory, the intruder may pick a fight with her. What are the risks if my cat gets into a fight with another cat? 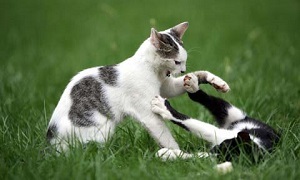 When cats fight, they inflict injuries with both their claws and their teeth. These curved weapons mean that both cat bites and cat scratches can inject bacteria and other germs deep under the skin of the victim, potentially causing a painful abscess at the site of the injury, or more serious cellulitis or septicemia that spreads to other parts of the body. In addition, feline leukemia and feline immunodeficiency virus are spread through the saliva, and your cat can get a fatal infection if the other cat is carrying one of these diseases. For more information, see our handouts on Feline Immunodeficiency Virus, Feline Leukemia, and Fight Wound Infections in Cats. Isn’t my cat capable of defending herself against other animals? Although cats are good hunters, and we think of them as being able to defend themselves with their teeth and claws, outdoor cats often become the hunted species, particularly to larger predators such as dogs, coyotes, foxes, some of the large predatory birds, and even alligators if you live in alligator country. If you live in an area where there are poisonous snakes, they present a serious threat to a cat that inadvertently comes in contact with them. Cats that roam outdoors are at even greater risk of injury or death from other animals. Wild animals are usually more aggressive than domesticated cats, so fights may be more ferocious in nature, potentially causing life threatening injuries. In addition, wild animals may carry other diseases, including rabies, which could infect your cat. Are there any parasites that should be of concern to my family? Cats that go outdoors are at a much greater risk of picking up fleas, ticks or even lice. These parasites can cause itchiness or other problems for your cats. For more information, see our handouts on Fleas and Ticks. The soil outdoors may be contaminated with parasite eggs such as roundworms that are spread by the feces of raccoons, dogs or other cats. Cat roundworms in particular can be harmful to your cat. If your cat decides to hunt and eat mice or birds, it could get a tapeworm infection – even though tapeworms do not cause serious problems in adult cats, it is revolting to find tapeworm segments on your cat or in its litter box. Other less common parasitic diseases that your cat can get include lungworms from eating crayfish and giardia infections from contaminated soil or water. Are there any other safety concerns? Your cat can be exposed to poisons such as slug bait or other pesticides that are sprinkled on neighbouring gardens, or can get into toxic substances that are stored in garages or sheds. If your cat eats mice or other rodents that have been poisoned with one of the short acting rodenticides, she can be exposed to these toxins and become ill. Contrary to popular belief, cats are not naturally wary of cars. Even in quiet suburban areas, where traffic travels at relatively low speeds, cats will always lose in an encounter with a motorized vehicle. The final concern about your cat’s safety outdoors is her risk from injury from other humans. Not everyone likes cats that roam, and some people set traps to catch cats that they feel are pestering wild birds or soiling their gardens. Cats have been brought into veterinary clinics and animal shelters with injuries from BB guns, arrows, or shotguns. Although it is usually a rare and isolated occurrence, cats that are outdoors can become the victims of deliberate animal cruelty in the hands of disturbed individuals. Despite these risks, I still believe that my cat should go outdoors. How can I ensure my cat’s safety? 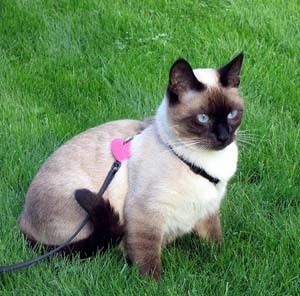 You can train your cat to wear a leash and collar and go for walks with you if you feel that she needs to have fresh air and exercise. If space permits, you can purchase or make a cat enclosure that will allow your cat some freedom to be outdoors in a more controlled environment. If you do choose this option, you should be aware that your cat can still come in direct contact with other cats through the open walls of the enclosure. Although your cat won’t be able to directly fight with these intruders, she will be at risk of picking up infectious diseases or parasites. Advise your veterinarian of your cat’s situation so that the appropriate protective measures can be taken.